Xerxes I (Old Persian: 𐎧𐏁𐎹𐎠𐎼𐏁𐎠 x-š-y-a-r-š-a Xšayaṛša "ruling over heroes", Greek Ξέρξης [ksérksɛːs]; 519–465 BC), called Xerxes the Great, was the fourth king of kings of the Achaemenid dynasty of Persia. Like his predecessor Darius I, he ruled the empire at its territorial apex. He ruled from 486 BC until his assassination in 465 BC at the hands of Artabanus, the commander of the royal bodyguard. Xerxes I is one of the Persian kings identified as Ahasuerus in the biblical Book of Esther. He is also notable in Western history for his failed invasion of Greece in 480 BC. His forces temporarily overran mainland Greece north of the Isthmus of Corinth until the losses at Salamis and Plataea a year later reversed these gains and ended the second invasion decisively. Xerxes also crushed revolts in Egypt and Babylon. Roman Ghirshman says that, "After this he ceased to use the title of 'king of Babylon', calling himself simply 'king of the Persians and the Medes'." 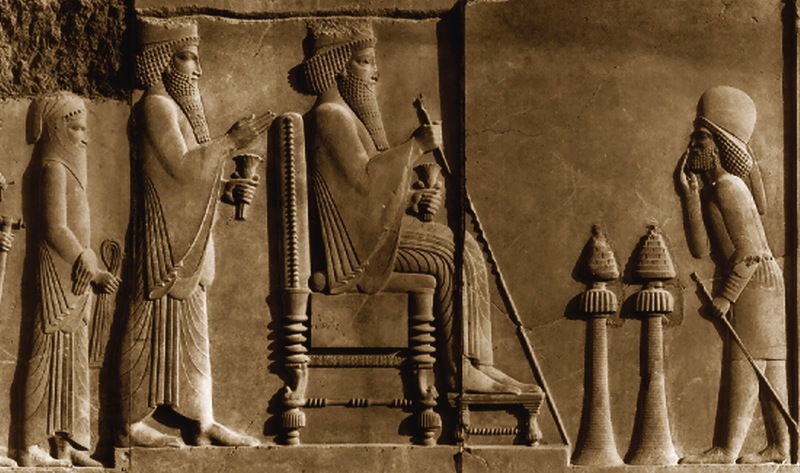 Xerxes oversaw the completion of various construction projects at Susa and Persepolis. The bas-relief below from Persepolis shows Darius I, the Great who is seated. He is followed by his son, the Crown Prince, Xerxes. Xerxes is depicted in the same size and with his head at the same level as his father's. This indicates not only that Xerxes was the heir apparent, but also co-ruler with his father, Darius. Immediately behind Xerxes is Nehemiah; here seen as the Chief Cupbearer, a position of highest rank with a function similar to that of "Prime Minister." The kings are receiving tribute. Interesting how father and son were considered co-rulers. I wonder if the son was the wiser during this period of co-rule.